Boomerang Theatre Company’s playbill art. Inspiration comes in serendipitous doses. That at least is the case for The Mushroom Cure by Adam Strauss and developed and directed by Jonathan Libman. In his Fringe Fesitval winner (2016 Overall Excellence for a Solo Performance,) Strauss recounts his attempts to self-medicate his crippling OCD. Fittingly for a solo show that explores the mental health benefits of hallucigenic fungi, The Mushroom Cure is simultaneously being performed in the East Village (at Theatre 80 St. Mark’s), and in Berkeley and (fleetingly) in LA. Sponsorship for the productions is provided by The Multidisciplinary Association for Psychedelic Studies (MAPS), a psychedelic research and advocacy organization. Smith Street Stage is putting on the greatest summer comedy in the repertoire at The Actors Fund Arts Center in Brooklyn. A Midsummer Night’s Dream, as directed by Jonathan Hopkins, is transported to our New York, looking at the magic in our home town in the spirit of Shakespeare. There is more Shakespeare on offer, of course, this summer; as is its custom. the Public gives us Shakespeare in the Park, but this year, Boomerang Theatre Company is puttng on Twelfth Night (or What You Will), directed by Sara Thigpen, on the lawn in Central Park. Be grateful to the Bard as Twelfth Night is a tonic for our times. You have to go a little further these days to deliver cutting-edge. Tricks of the trade from happenrings and multi-media presentation to theater of the absurd have become standards in all staged productions, and not just the experimental ones. Playwrights reciting monologues, incorporating video into their stories, engaging — or surrounding– the audience are all part of the main stage and the “fringe” scene. These days, it’s probably content more than style that distinguishes “fringe” entertainments from the mainstream. And speaking of going far, some of you will go as far as Scotland to the venerable 65-year old Edinburgh Festival Fringe. This year, we’ve already previewed a very small sampling of what you should see at Edinburgh Festival Fringe while East to Edinburgh was at 59E59 Theaters earlier. Some of us are staying closer to Broadway at downtown’s New York International Fringe, celebrating its sixteenth anniversary from August 10th to 26th. First for the NYC homebodies: At FringeNYC, there is a plethora of events including 1200 performances ranging from monologues to musicals. 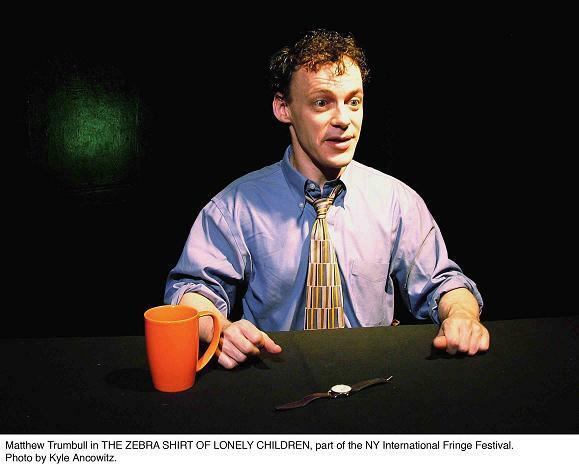 Among them, a New York premiere of the intriguingly-titled “The Zebra Shirt of Lonely Children,” starring Matthew Trumbull, running from the 11th to the 24th of August at The Players Theatre.The Players, of course is just one of the many venues at which FringeNYC is being shown. “Mother Eve’s Secret Garden of Sensual Sisterhood,” an award-winning fringe-fest musical, with an equally interesting title, is playing at The Players Theatre from the 15th through the 26th. Sandro Monetti’s monologue about Hollywood’s big names, “Clooney, Cowell, Pitt and Me…” is tabloid newstand fun. He’s performing only on August 18th. (Learn more at www.sandromonetti.com.) It will come as no surprise to hear that naricism comes with being celebrated in tinsel town, but it is nice to hear about it from Monetti’s first-hand encounters. “Eat Sh*t, How Our Waste Can Save The World” definitely falls into the far-out subject matter bucket.